Pushpin Pushpin Museum Museum is the second exhibition of expat and Russian born artists teaching art in Moscow at the British Higher School of Art and Design. It aims to create a forum for personal responses to life in Moscow and Russian culture seen through the non-native artist’s eye. This exhibition brings together a diverse group of artists, so expect an eclectic mix of mediums, media and concepts. The first exhibition, in Spring 2015, was inspired by the legacy of the cult apartment exhibitions held in late 70s Moscow. These apartment exhibitions were born out of the necessity to share work either censored or ignored by official channels. This situation drove the artists underground, and put forward an argument for the importance of artistic expression in a modern society. The original Pushpin Museum took residence in the rented apartment of one of the participants. The environment brought with it an unexpected requirement. Artworks had to be displayed, at the landlady’s behest, using nothing more damaging than a pushpin, so as not to permanently mar the walls. The Pushpin has now grown to become more of a platform: for immediacy, urgency, work in progress. The name also holds further, greater resonance; the wordplay chimes of its intellectual foundations, intimated by Russia’s greatest of poets, Alexander Pushkin, whose birthplace was just around the corner from the apartment. The participants’ primary role in Russia is to teach art, and thus the exhibition provides these trained artists the opportunity to present a model of professional practice to their students; the indisputable necessity to express and exhibit, unrestrained yet contaminated by Russian encounters. Pushpin Pushpin Museum Museum - вторая выставка «экспатов» и российских художников, преподающих современное искусство и дизайн в Британской Высшей Школе Дизайна в Москве. Целью выставки является создание арт-площадки для творческих высказываний, основной темой которых является индивидуальное видение жизни в современной Москве глазами «постороннего» и глазами резидента, а также предоставление возможности высказать свое мнение о современном российском культурном контексте. Эта выставка объединяет различные группы художников, поэтому в итоге получился эклектичный микс разнообразных медиа и концепций. Первая выставка состоялась весной 2015 года и была создана под впечатлением советского наследия квартирных выставок, проводимых в Москве в конце 70-х. Традиция «квартирников» возникла в художественной среде из необходимости делиться своим творчеством, которое подвергалось преследованию цензуры и игнорировалось официальными каналами. Несмотря на свой «андерграундный» характер, движение квартирных выставок в очередной раз доказало важность роли художественного высказывания в современном обществе. Оригинальный Pushpin Museum возник в пространстве съемной квартиры одного из участников группы. Обычное «бытовое» требование породило необычную идею. По настоятельной просьбе хозяйки все произведения должны были экспонироваться не иначе как при помощи канцелярских кнопок, дабы не испортить отремонтированные стены. В настоящий момент инициатива создания Pushpin превратилась скорее всего в активно развивающуюся платформу для генерации идей, проведения экспериментов с медиа и демонстрации того, что является процессом создания произведения. Не стоит забывать, что для создателей проекта важно дополнительное звучание названия «Pushpin» как «Pushkin». И это не просто намек на интеллектуальную основу проекта. Дело в том, что Александр Сергеевич действительно родился почти за углом дома, к котором был основан Pushpin1. Основной вид деятельности участников проекта – обучение молодежи творческим профессиям. Таким образом выставочный проект Pushpin Museum предоставляет возможность преподавателям продемонстрировать модель профессиональной практики своим студентам. К тому же сам формат выставки, как способ общения между преподавателями и студентами, на наш взгляд, является очень ценным опытом в контексте «перегруженной» и сложной коммуникационной среды современного мегаполиса. I have lived in the Basmanny district for more than 16 years. Usually I walk the streets, which have not significantly changed since the days of Pushkin, who mentions in his novels the same names: Razguliay, Basman Street, Lefortovo sloboda. I have begun to use this aspect in order to draw a parallel between the thoughts of people of the 19th century and the21st and to create a dialogue of generations through the visual range where I combine the actual text of Pushkin's,own diary entries and encyclopedic information. This became the motif of creating a story about these places and times and the people who have lived and live today around the same area but with around 200 years apart. The Scottish scientist, James Clerk Maxwell is a relatively unknown figure in the history of science, but his discoveries were so influential that Einstein once stated 'One scientific epoch ended and another began with James Clerk Maxwell'. Among his many discoveries Maxwell was responsible for the 1st ever colour photograph. In 1861 he used black & white film shot through red, green and blue filters- and recombined these with projectors onto a screen to make the colour image of a tartan ribbon. Later the Russian photographer, Sergei Mikhailovich Prokudin-Gorskii (1863-1944) undertook several colour documentary projects of the Russian Empire from 1909 to 1915, using a similar technique. A body of work which is now a collection in the Library of Congress in the USA. When Ruskin visited venice in 1849, the city was clearly at risk from both the forces of nature and human neglect. 150 years later the city is still at risk despite major efforts, and has the problem of managing hoards of tourists. This series of photographs is intended to echo the early photographic works of Carlo Naya and Carlo Ponti, taken in the 1850’s. They also aim to represent the stillness which these works conveyed and the silence which you can easily experience in Venice today if you venture just a few steps off the beaten track. That stillness may also be experienced as a kind of lament, as many building could still be lost owing to poor conservation initiatives and technique. The photographs in this series employ the same scientific principles discovered by James Clerk Maxwell and mastered by Prokudin. In this case images are captured almost simultaneously in a small toy camera which has 4 lenses which I have adapted for the purpose of creating colour images from B&W film. 3 of the lenses are covered with the primary red, green and blue filters. The resulting B&W images are then recombined in Photoshop CMYK channels to create the final colour composite. David Kinney is a Scottish born photographer who graduated from Edinburgh College of Art. His personal practice revolves around notions of the Utopian Ideal and the subsequent physical manifestations of this in the built environment throughout history. our mind and memories, and our physical history; how our bodies change through natural interventions such as pregnancy, birth and age, as well as through medical interventions that cause scarring and physical changes. These histories affecting our outside and inside appearances make up who we are and how we perceive ourselves. With many of us feeling ill at ease with our bodies, and within our own skin, we are continually looking for ways to reinvent ourselves; to enhance and distort. Concerns and anxieties about my own body and self-perception have long been ongoing themes within my work. In much of my work, through the use of self-portraiture, I looked to create new versions of myself that I deemed more worthy. Within my current practice I am still concerned with these issues, but I am now looking too extend and develop this dialogue further through a more multi- disciplinary way of working. Merging analogue and digital, the traditional with the contemporary, and looking at my own personal ‘history’ within my body, I am looking for new ways to redefine the term ‘self-portrait’, through honoring, celebrating and learning about the different layers that ultimately make up my ‘self’. In response to being in Moscow, the isolation and departure from my cultural familiarity has enhanced the focus on my approach to my theme and has strengthened my overall practice. They are 3 large scale sketchbook page made since November 14th. Since I have moved to Russia, I have the sensation to be a silent and distant spectator of the dramatic changes going on in Europe and especially in France. Since in Moscow, I don’t have the feeling to be blinded by socials and entertaining curtains and I want to find a visual way to express this. How basic gestures of social interaction, having a coffee, a drink, reading a book make terrible events a short term chat when it should be the occasion to gather together and address the real importance, feelings, causes and effects of what is going on. The Rustaveli National Theatre, Tbilisi, Georgia. 1887. Presented is a selection of exploratory studies relating to an on-going project for the revitalisation and restoration of parts of Georgia’s National Theatre. The building was the centre of the country’s avant-garde art scene in the pre and inter-war years, serving as a meeting place and social condenser, as expressed in the early 20th Century murals that line the vaulted basement by artists including Lado Gudiashvili and David Kakabadze. Working with a team of local experts, including the Georgian Ministry of Culture, the project aims to re-instill some of the freedoms and opportunities offered by established cultural institutions. The project is scheduled to be on site within six months, with parts being open to public within a year. Layers, colors, markers, plastic. Tiny mark, huge image. Jeweler's glasses. Etching needle. Ink. Roller. Screen print. Nail polish. My family's old slide projector. Some paintings I like. Some paintings I don't like. A lecture by a friend. Things I know, things I don't know. Slides. Handmade. A performance. Moscow born. New Jersey raised. New York educated. Repatriot. Printmaker. My life in Moscow is constant juggling act to maintain those activities that interest me and drive me, alongside the need to work and earn money. 3) my sporadic desire to keep a diary. 4) the draining reality of maintaining a regular, full-time job. These drawings are an attempt to consolidate these contrasting facets of my life. This appeals to me conceptually, but more importantly, it allows me to manage these divergent threads towards a common direction. I followed the same process in all the drawings. I have taken a doodle from my collection, the majority of which have been created during staff meetings and lectures in my day job. The selected doodle is pasted onto a new sheet of paper. I then draw around and over the doodle, responding to it; or sometimes, to things that have happened during the day. Then I look at finished drawing and title it with a verb - in Russian. I always find verbs the hardest kind of new word in Russian to memorise, so I am hoping that these drawings will serve as a visual aids to impregnate this new vocabulary into my memory. When in a bad mood, my grandmother baked bread. It was a matter of principle. Pounding, kneading and mixing the dough, she would spend her kinetic energy transforming her frustrations into something positive, something delicious. Destructive impulses became ingredients in her new creation and by the time the smell of baking bread escaped the oven and filled the house, we were all transformed – calmed and comforted. Energy is never lost, only transformed. ‘Good Grief!’ plays with the idea of eating someone else’s angst. Participants are invited to eat a Victoria Sponge packed with an undisclosed number of pushpins. Ostensibly inoffensive, one must eat attentively to avoid the minefield within. A symbol of pull-yourself-together-and-have-a-cup-of-tea-English Victoriana, the pushpins transform the cake-eating into a psychological game akin to Russian roulette, Building on previous work 'Scent Portraits of Invisible Labourers', 'Good Grief' also uses non-visual mediums smell, touch and taste to allude to invisible structures within production and consumption and latent violence therein. 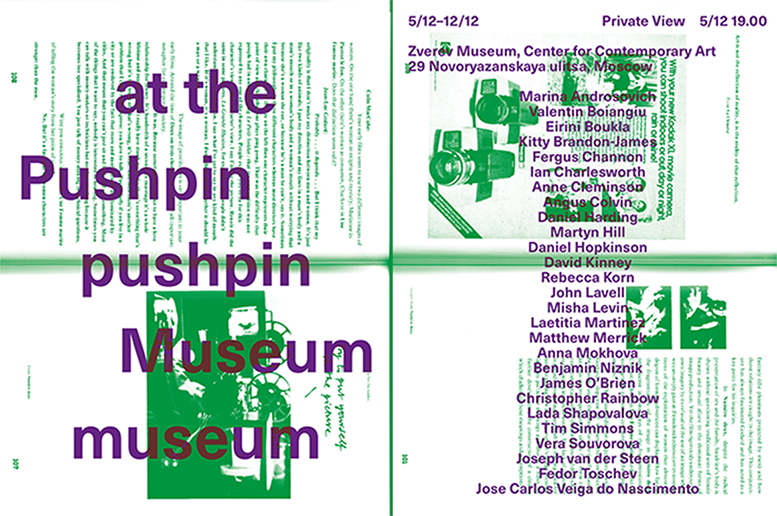 It is composed of two parts: a filmed performance of Pushpin exhibitors and BHSAD lecturers, and an installation. The work is concerned with the issues of experiential response to the artistic process and what it means to represent a visual image through the personal life experience. The painting demonstrates some kind of visual play with the perception of the painted surface and different ways of handling the process of application of oil paint to the canvas. The use of carpet imagery refers to the former tradition to put a carpet on the wall, and it represents the symbol of soviet past, when people used to mount carpets to cover walls in order to isolate themselves from the surroundings. Nowadays an image of a carpet on a wall indicates a kitschy cheap way of interior decoration, and also bad habit of taking photos with a carpet as a background. In a personal sense, a carpet links to a sense of home. In the work, the visual imitation of the carpet is based on the real carpet which was given to the artist as a wedding gift and it has been part of the family surrounding for almost 10 years. The artist’s children have been growing up with it and for the older son this carpet has served as a playground for ‘battles’ and ‘forest hunts’. Like children imaging and putting different bits and pieces together, the artist is playing around with different drawn, captured and found images through manipulating and sticking them together in order to replicate the notion of the game and to discover new visual meaning. Furthermore, the work is referring to the old English child's game called ‘Pushpin’. Pushpin was immortalized by Jeremy Bentham when he wrote in The†Rationale†of†Reward†that "Prejudice apart, the game of pushpin is of equal value with the arts and sciences of music and poetry." John Stuart Mill, who disagreed with Bentham on this point, misquotes Bentham, saying, "Pushpin is as good as poetry." For Pushpin2 exhibition this new body of work looks at a usage of popular design and culture in the reassessment of certain Modernist tropes and a contemporary Abstraction noticeable for its Constructional and Systematic applications relaying its Russian avant-garde roots. The first set of paintings have a collage approach and attitude which is focused around ideas of the internationalised visual codes of the Russian avant-garde via the appropriation and postproduction (a reconfiguring re-contextualization of already worked material). This suggestively makes use of Soviet era printed ephemera; the minor transient documents of everyday life. Through the negation of the original photographic and the written content, the political and the ideological message gets diluted and furthermore obliterated with the help of the process of painting and medium translation in general, which is more emphasised in the second set of water based paintings. In this way a new mode of abstraction is gained and it proposes a visual engagement based solely on the mechanisms and the formalities of image making. I strongly believe in notions of found and earned abstraction in the everyday surroundings with specific characters to various local environments. Some of my projects have in common the use of language as a creative obstacle. In addition to that, they also share the peculiarity that its eventual interest is confined to some restricted groups. The exclusion that they determine can be either integral part of the work or merely the result of the fact that an art piece can be meant to a given community, being the exclusion of the other scarcely important. Untitled #2, the second piece of a series in progress, is preceded by one I made in Morocco with the collaboration of an old public scribe and it was already exhibited this year on the Bienal Internacional de Arte de Cerveira. Although with remarkable differences, both pieces were made through a kind of transliteration strategy. To produce untitled #2 I wrote a small text, in English, which was translated into Russian and then read to me while I struggled to put these sounds, for me meaningless, into words of an, obviously, non-existent language. I hope that the few clues that will light up here and there while reading the text, and the dialogue that is supposed to happen with the image that complements it, can serve as invitation to follow a path that will lead, inevitably, to assumptions that will never be certainties. Thematically I investigate contested narratives, conceptual zones, and the appropriation of technology as well as the repurposing of human exploration and political ideology through the lenses of observation, presentation and humour. Contradictory anecdotal perspectives, myths and legends feature heavily as narrative underscores for the works I make. The temporality of the arrangement of the components in the sculpture, and the minimum manipulation of its parts, touches on the idea of transience. In accumulating the pushpins as piles instead of fixing them securely, Androsovich maintains the natural state of the objects, in order to create a constant shift between the actual and the metaphorical reception of the sculpture. It is a mixed message that juxtaposes polarities, such as the physical and the immaterial, real and conceptual, the present and the absent, and the inward and the outward movements. The characters are fictitious yet exist as part of the everyday in Moscow and Russia. The figures are the manifestation of my experiences, my perception of the resourcefulness I see around me in people. The same resourcefulness is found the world over, yet here I present characters that perhaps are typical of Moscow. These figures do represent differences, from my UK homeland. To me Russia is a country of extremes; here my observations of Russian idiosyncrasies begin with summer. Winter is another story. This collection of compositional paintings is a direct response to the continual repetitive experience of living and working in Moscow. The reminder of time passing is at its most poignant and apparent through simple rituals that reoccur at set times each day. My walk to work is a routine that is set within constraints of necessity. I must leave the house on time. Far from fully conscious, head down, in my own world, I catch snap shots of compositions of roads, pavements and buildings. It is not until I reach the bridge half way that I realise I am even walking and become aware that it is another day. Once at the bridge I instinctively check my phone and always see that it is 9.45am. This snatches me from my dream state and I look up. I see my day ahead and accelerate. My mind becomes sharper and I project the advancing multitude of tasks. I become curious of what lies in front of me. As I arrive I am ready and the sun blinds me before I enter the building. This series of acrylic paintings is an attempt to suggest this walk from abstracted compositions of floor to representational scapes that my eye appreciates each day.